Found on foliage of Lantana at Moshi, Tanzania. December 2013. Length is about 7 mm. The first two pair of legs are rotated into a forward-facing position and aid in the capture and securing of prey. 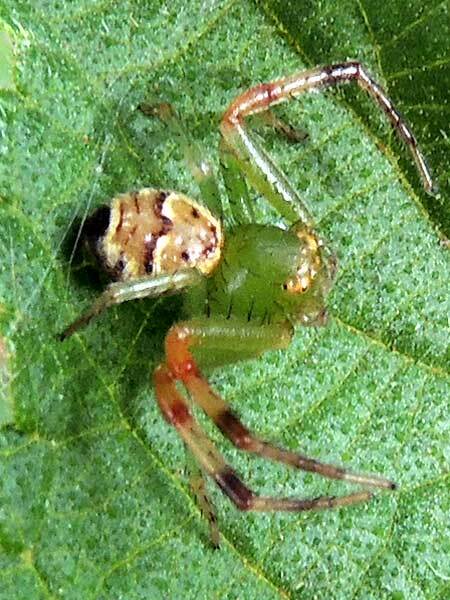 Crab spiders capture prey without the use of a sticky web. Instead they sit-and-wait at a prime spot for encountering insects; this is often on a flower, but if no flowers are present fresh new growth on a plant is the preferred hunting spot. Copyright Michael J. Plagens. Page created 20 February 2014.